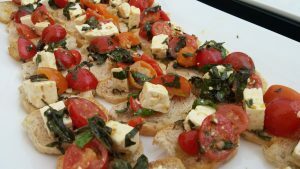 One of 2017’s offerings at the sampling – bruschetta made with all local ingredients! So once in a while it’s good to stop and appreciate what an incredible place this is – how lucky we are to have rich soils, a mild climate, and protected farmland. Langley Eats Local is the chance to do just that on Wednesday, August 8. Every August, at the peak of the season, Langley food-lovers gather to celebrate the abundance of the Fraser Valley with 50+ of the region’s best vendors converging at the Langley Community Farmers Market. Join us to get the goods, from fresh fruits, berries, and vegetables to cheeses, wines, ciders and more. The highlight of the event has to be the sampling. No, not sneaking bites from every vendor’s tray! The Langley Eats Local sampling is a gourmet affair prepared by none other than Chef Adrian Beaty, our favorite advocate for farmers and local producers. Tickets are only $5 for five different appetizers and are now available online (with a surcharge, or with no extra charges in person, see below). Appetizers will be served at 1:00pm and 3:00pm, so make sure you get the right tickets! As if that wasn’t enough, Langley Eats Local is also the first day of the Eat Local Challenge. Warning: This challenge is only for the bravest of foodies. It involves pledging to source as much of your food as possible from local farms and producers. We promise not to tattle if you cheat, but we don’t think you’ll even want to, when you hear what there is to eat around here. And on top of basically spending a week feasting on farm-fresh deliciousness, participants also get chances to win prizes by posting on social media, and everyone takes home a goodie bag of local food coupons. What do you have to lose? Sign up for the Eat Local Challenge and eat local from August 8 to August 15! So grab your competitive edge along with your picturesque shopping basket and a few friends with refined tastes, and we’ll see you at the Market on August 8th, showing some love for our farmers.